Despite all the attention given to last week's National Association for the Advancement of Colored People's resolution against the Tea Party, all three broadcast evening news programs completely ignored Monday's revelations of racist comments made at one of the civil rights organization's meetings in March. 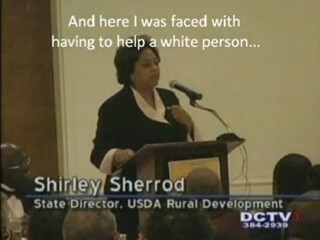 At 8:18 AM Monday, Big Government reported that on March 27, Shirley Sherrod, the USDA's Rural Development director for the state of Georgia, delivered a racism-laden address at the NAACP's 20th Annual Freedom Fund Banquet. SHIRLEY SHERROD, USDA: The first time I was faced with having to help a white farmer save his farm, he took a long time talking but he was trying to show me he was superior to me. I know what he was doing, but he had come to me for help. What he didn't know while he was taking all that time trying to show me he was superior to me was, I was trying to decide just how much help I was going to give him. I was struggling with the fact that so many black people had lost their farmland, and here I was faced with having to help a white person save their land. So I didn't give him the full force of what I could do. I did enough, so that when he, I assumed the Department of Agriculture had sent him to me, either that or the Georgia Department of Agriculture, and he needed to go back and report that I did try to help him. So I took him to a white lawyer that had attended some of training that we had provided because Chapter 12 bankruptcy had just been enacted for the family farm. So I figured if I take him to one of them, that his own kind would take care of him. As most readers are aware, this video has gone viral over the Internet. The Drudge Report posted its first piece concerning this matter at 5:28 PM. Yet, according to closed caption dumps, the three broadcast evening news programs completely ignored the story. This seems particularly hypocritical of ABC and CBS which both did detailed reports on the NAACP resolution against the Tea Party during their respective morning, evening, and Sunday political talk shows last week. For its part, NBC also focused a lot of attention on this matter on Sunday's "Meet the Press." I guess these news outlets are only interested in the NAACP when it's accusing others of racism and NOT when they're exhibiting it. CNN also seems nonplussed by this development. Having done scores of reports on the NAACP-Tea Party resolution last week, the only mention of this new controversy Monday was by St. Louis Tea Party head Dana Loesch who brought it up on "Larry King Live." As such, according to LexisNexis, the supposed most trusted name in news hasn't fully covered this story yet, although transcripts are still coming in. I can also find no wire service reports. Moving forward, as this matter was serious enough for Sherrod to resign late Monday, will it get more attention in the coming days, or will NAACP-loving journalists continue to ignore this story much as they did last year's ACORN controversy?